In an ongoing effort to clean up their main waterway – the Williamette River – the city of Portland, Ore. authorized construction on three new shafts as part of the East Side Tunnel Combined Sewer Overflow (CSO) project. The goal is to reduce water and sediment pollution, improve watershed health and restore habitat for endangered salmon and steelhead. Work on the project began in 1993 with general improvements to the sewer system. In 1999, the CSO program got underway, diverting streams that once flowed into the sewer system back into the Willamette River, upgrading pumping stations and installing a CSO tunnel on the western side of the river from the Marquam Bridge to the Swan Island pump station. Now in its 17th year, the project has reached its final stage: the construction of an East Side CSO tunnel, which will mirror its western counterpart, running from the intersection of Southeast 17th Street and McLoughlin Boulevard to the Swan Island pump station. To service the six-mile-long, 26-foot-diameter tunnel, seven shafts will connect existing overflow pipes and provide above-ground access. The Taggart shaft, a 21,500-square-foot structure located north of the Ross Island Bridge off Southeast MLK Jr. Boulevard on Southeast Taggart Street, commenced in 2008 and is now completed. This shaft serves as a tunnel connection for water overflow. In addition, the Port Center shaft, an 18,000-square-foot structure located at North Port Center Way, adjacent to the new Swan Island Pump Station, is the northern terminus of the East Side CSO tunnel and is one of two locations where the tunnel boring machine (TBM) named “Rosie” will be removed. The final shaft included in this phase of construction, the McLoughlin shaft, is a 16,000-square-foot structure located at SE 17th Avenue and McLoughlin Blvd. The McLoughlin shaft is the southern terminus of the East Side CSO tunnel and is the site of the second location where the TBM will be removed from the tunnel. When completed, this project will boast a 94 percent reduction in the volume of combined sewage and storm water that now overflows to the river when it rains. This will not only improve the water quality in the lower Willamette, but it will eliminate most combined sewer overflows into the river. To accommodate multiple pours at different heights, the contractor, Kiewit Bilfinger-Berger, used approximately 40 D22 cantilever dam brackets from Doka with spindle struts on the bottom slab as starter blocks, and simply reconfigured for lifts to support almost 2,100 square feet of Frami clamp-style panels in a chorded radius geometry. Doka engineering worked closely with Kiewit Bilfinger-Berger to devise a sequencing plan that not only made each lift easier to climb, but also allowed on-field operators the ease of moving panels with a consistent final finish pattern from the bottom of the shaft upwards to ground surface within approximately 10 casting steps. In addition, 13-foot-high crane lifts (10 to 11 each) with the D22 cantilever system “rollback” allowed the forms to be easily retracted 30 inches for the purpose of cleaning, oiling and attaching leading anchors for the next jump. The D22 cantilever system included a safe 8-foot nominal work platform at the bottom of the form level and a walkway at the pour level. A trailing platform on the level below was used for the purpose of retrieving the cones and performing finishing work. 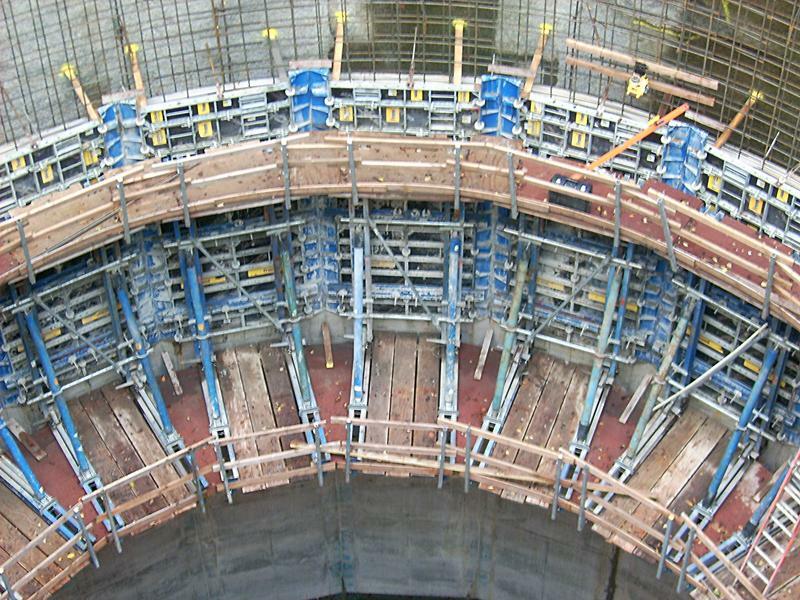 According to Pietro Da Sacco, the group leader of the project for Doka, the Frami wall-forming system was the ideal solution for this particular application because Kiewit Bilfinger-Berger had effectively used this product for a previous phase of the project in 2006-2007. 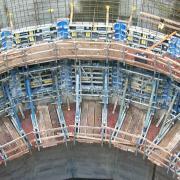 The Frami wall-forming system provided formwork geometry designed to facilitate changes and to be relocated from lift to lift, all while optimizing production of labor. “The special anchor locations were designed for the next lifts to conform to all geometric changes, which has the project ahead of schedule at this time,” said Da Sacco. Another challenge was reacting to the design/build changes for submittal to the city before the start dates. By supplying professional engineering drawings to the contractor and the City well in advance of the formwork needs at the site, the schedule was accelerated. Doka’s professional engineering expertise as well as technical support, including numerous site visits, allowed the construction critical path to be ahead of schedule. “Doka’s engineering team worked together with Kiewit’s engineering team to get all pertinent information required to perform at a maximum level of efficiency,” said Da Sacco. Safety was another concern. With knowledgeable field service technicians on the jobsite for three days, Doka’s team was able to personally train the Kiewit Bilfinger-Berger crews on the safe practices of the Doka formwork, which included working level decking with no holes or trip hazards. According to Paul Contreras, Account Manager, Doka was able to provide labor savings from design and product clamp-style technology. Working closely and effectively with Kiewit Bilfinger-Berger proved to be the most advantageous method to create a positive relationship and outcome that essentially benefited both Doka and Kiewit Bilfinger-Berger. With the successful installation of the shafts completed, the project is ahead of schedule both for its completion date of 2011 and its ultimate goal of creating an even healthier city. Thank you for your interest - East Side Tunnel Combined Sewer Overflow (CSO) project. Thank you very much for your interest - East Side Tunnel Combined Sewer Overflow (CSO) project.